Fifth graders at Trevvett Elementary have been learning about Henrico county government (HC.2) in Social Studies, and they’ve been identifying the main idea and summarizing nonfiction text in Language Arts (SOL5.6d,e). Since elections are coming up in November, students in Ms. Harris’s class and Ms. Brown’s class conducted research to find information about the candidates running for office in Henrico County. Then we summarized our findings to create campaign posters. First, we used this site to see the list of candidates. Each student chose a candidate they weren’t familiar with since many of them already had a family favorite, and I wanted them to be exposed to different viewpoints. Next, they did a Google search for their candidate and explored their campaign website. I showed them where to look to find the “Beliefs” or “Issues” sections. After the students read some of their viewspoints, we discussed ways to summarize their views into a couple of sentences for the campaign poster. Students could use Google Docs, Google Slides, or Google Drawings (as well as other tools like DesignCap) to make posters, but we chose to use Google Drawings since we hadn’t used that tool yet. For the poster’s background, we added a square shape, made it as large as the poster, and changed the fill color so it was a solid color or gradient. Then we clicked “Insert > Word Art” and typed the candidate’s name. I showed them how to change the font, fill, and outline color of the text. We imported a photo of the candidate using the Google image search feature. Finally, we added a speech bubble with the Shapes button and typed a summary of the candidate’s beliefs. 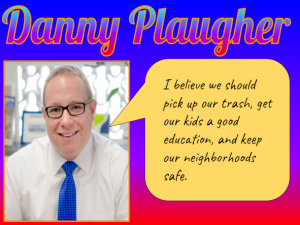 We shared our campaign posters on Schoology, but you can see them all here. First graders at Holladay Elementary have been learning about the fall and how it affects animals, people, and the weather (SOL1.7). Today, students in Ms. Sokolowski’s class used WeVideo to create their own fall videos. 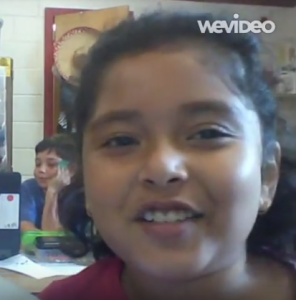 First, they chose a partner to work with, and one of the partners signed into WeVideo using their Google account. I showed them how to press the red record button and set up their webcams following the on-screen prompts. Next, we brainstormed ideas to talk about, making sure they understood that the topic was fall (sometimes first graders like to go off topic :). We also discussed the importance of looking at the camera and speaking loudly and clearly. Ms. Sokolowski and I recorded a sample video to model the process for the students. Finally, the students were ready to record their own videos. We walked around, providing guidance as needed and trying to stay out of their movies. When they were finished, I showed them how to save their videos. We downloaded them and saved them to our Google drive (if you have the free version of WeVideo, the videos will eventually be removed over time, so be sure to download them if you want to keep them). You can see some of the students’ videos here. Varina Elemenatry started a reading incentive program to encourage students to read 40 books or more. Today we recorded a rap video that will be shown to the whole school, explaining the program. Mr. Jones, the PE teacher, and Ms. Jackson, the art teacher demonstrated their rapping skills with raps they wrote themselves! Students also choreographed their own dance routine to accompany the video. 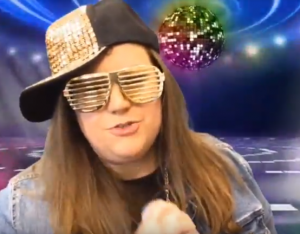 My job was to add the green screen effects. Since we didn’t have a green screen, I just hung up some green bulletin board paper. I also hung up some orange bulletin board paper for students who were wearing green (you can use any color, as long as the performers aren’t wearing that color). Then I recorded them using the DoInk Green Screen app on an iPad. Within the app, you can choose the color you want to be transparent and add a background to replace it. I used some generic music video backgrounds that I downloaded. The last step was to add the song files. We shared the finished video on Google drive so all the students could see it. You can watch it here. Fifth graders at Varina Elementary have been learning about changes in the Earth’s crust due to plate tectonics (SOL5.7e). Today, students in Ms. Gallahan’s class used their analysis skills to look for correlations between a map of the Earth’s plates and a map of current earthquakes and volcanoes. First, they made a copy of a Google drawing template showing a map of the Earth’s plates (you can get your own copy here). Next, I showed them how to add a fancy title using Word Art (Insert > Word Art). I demonstrated how to change the size, font, fill color, and outline. Then we went to this site to see where there are current volcanoes and earthquakes. The students were surprised to see so many going on all over the world! We took a screenshot of the map with the Snipping Tool (on Chromebooks you can also use the Windows Key + Ctrl + Shift to take a screenshot). We pasted the screenshot into our Google drawing, and I showed them how to make it half transparent using the Format Options menu (Adjustments > Transparency). The tricky part was resizing the screenshot so the continents were the same size and matched up on both maps. Once they were aligned, it was easy to see some correlations. 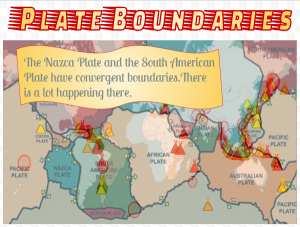 The volcanoes and earthquakes were happening along the plate boundaries! The plates map has arrows showing their movements, so we could figure out which ones were convergent, divergent, and transform boundaries. I instructed the students to get a shape from the Shapes tool, change its color, and type one or two of their discoveries and conclusions in the shape. Finally, we shared our posters in Schoology. You can see some of them here. Fourth graders at Varina Elementary have been learning about Virginia geography in Social Studies (VS.2) and rounding and place value in Math (SOL4.1). Today, students in Ms. Stevens’ class synthesized these concepts, along with research skills, to create Virginia Math quizzes using Google forms. First, I explained that we would be creating 1-question quizzes, but when we took each others’ quizzes, we would end up answering several questions. So their job was to create a really good question about place value or rounding that would make their classmates think. We reviewed types of questions they could ask: What is the value of the digit __? What number is in the __ place? How would you write this number in word form? What is this number rounded to the nearest ten thousand? Next, they had to do research to find a fairly large Virginia number. I showed them how they could use the microphone tool to audibly ask Google a question like: What is the population of Richmond? 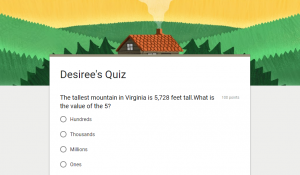 How tall is the tallest mountain in Virginia? How many chickens live in Virginia? How far is it from Roanoke to Arlington? How long is the James River? Once they had their number and a math question, we opened a blank Google form (New > More > Google Form), and they typed their question. I pointed out that their multiple choice answers should be tricky, based on errors that students typically make. For students who finished early, I showed them how they could change the theme of the form and add images. To turn their regular Google forms into self-grading quizzes, I demonstrated how to go to the gear icon at the top, click the Quizzes tab in the pop-up window, and change it to a quiz. Then, they had to mark the correct answer to their question. Finally, we shared the links to our forms on Schoology, and took each others’ quizzes. You can see them all here. 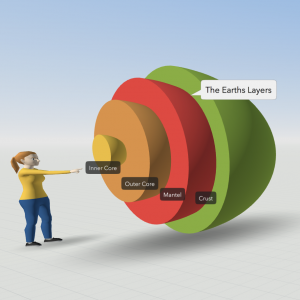 Fifth graders at Laburnum Elementary have been learning about the layers of the Earth in Science (SOL5.7d), so today students in Ms. Johnson’s class created 3-D models of the Earth using CoSpaces. First, I set up a free classroom account, and the students logged in with a code. Usually, the first thing you do in CoSpaces is click the Environment button at the bottom and chose an environment. We decided to use the default environment for this project to save time. Then, we clicked on Library button and chose the Build tab to find the half-sphere shape. We added that to our scene, and I showed them how to use the pop-up tools to raise the shape and rotate it. Right-clicking on the shape brings up a menu that we used to change the color of the shape. Since this represented the crust, we also added a label using the right-click menu. Then, we duplicated the shape, shrunk it a bit, recolored it, and labeled this new half-sphere as the mantle. Some chose to try to push the shape into the crust, while others left theirs out. The students continued in this way, adding the rest of the layers of the Earth. Finally, we chose a character from the characters library to add to the scene. The characters can be customized and given speech bubbles by right-clicking on them. CoSpaces has a coding component as well, but we didn’t have time to code during this lesson. 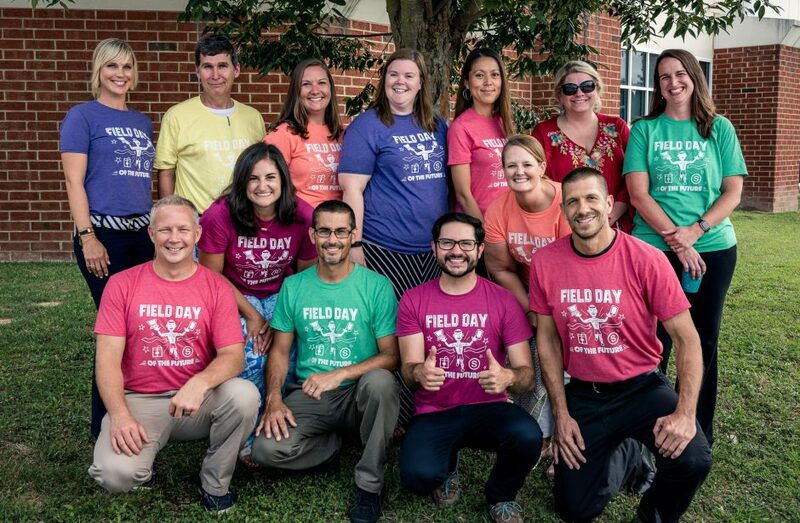 We shared our projects in Schoology, and you can see some student examples here. 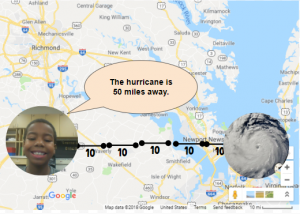 Second graders at Laburnum Elementary have been learning about extreme weather in Science (SOL2.6), skip counting in Math (SOL2.2a), and map skills in History (SOL2.1b). So today, students in Ms. Pope’s class reviewed all three concepts with a Google Drawing project. First, the students decided if they wanted to skip count by 2’s, 5’s, or 10’s, and they chose the corresponding template (you can copy each template by going here). Next, we right-clicked on one image holder and replaced it with a picture of some type of extreme weather (hurricane, tornado, blizzard, flood, etc.) using the “Replace image > Search the web” button. We added our own photo to the other image holder using “Replace image > Camera.” I encouraged the students to look surprised or scared in their photos since the extreme weather was heading their way! Now it was time to practice skip counting. We moved the map scale segments from the bottom to create a line showing the distance from the weather image to our photo. Then we skip counted the segments. Finally, we changed the words inside one of the speech bubbles to say something like, “The weather is ___ miles away.” You can see all their projects here.